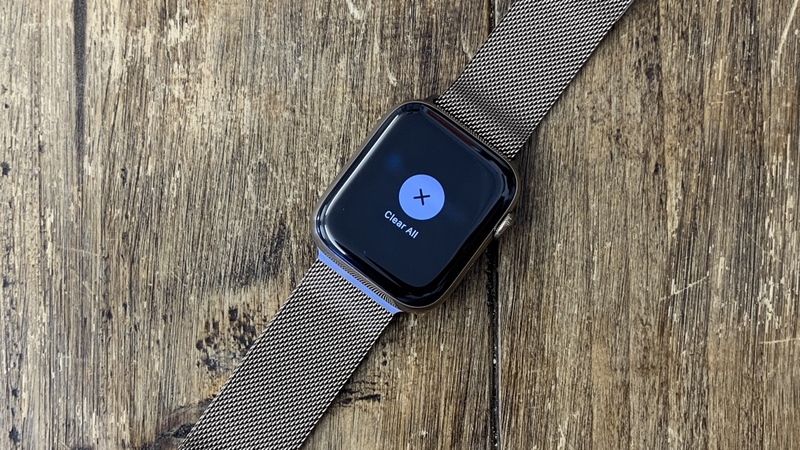 Clearing notifications on the Apple Watch may be simple once you've learned how to do it, but it's not immediately clear if you're new to the smartwatch. With apps like Instagram, WhatsApp and iMessage pinging notifications to your wrist directly from your iPhone, the Apple Watch's notification center can fill up pretty quickly - before you know it, you'll have worn out the Digital Crown because of all the scrolling. That's why we're here to walk you through how you can remove all from view with one touch and also how to mute them altogether - in fact, we'll even tell you how to find them, just in case you're struggling. Any questions? Drop them into the comments section below and we'll clear up any confusion. If it's your first time using the Apple Watch, you might be a little confused as to how you access your Notification Center. In actuality, it's the same as on your iPhone - simply swipe down from the top of the screen. This can be done from any screen, too, not just the home screen. To scroll through the list, simply use your finger or twist the Digital Crown, if you'd prefer to keep your view unobstructed. In order to read a notification, just give it a little tap; to read grouped notifications, tap the stack and then go through to the individual notifications. When you have an unread notification, you'll see a red dot at the top of the home screen. If you want to get rid of this appearing, simply open the Watch app on your iPhone, head to notifications and then 'Turn off Notifications Indicator'. Wondering why you only get them on either your Watch or iPhone? Well, if your iPhone is unlocked, you'll get notifications there, but if it's locked or asleep, they'll be sent straight to your wrist (unless it's locked via passcode). Also, be aware that when you dismiss a notification on your Apple Watch, it's also dismissed from your iPhone. As we say, if you've set your Apple Watch to mirror the notifications being beamed to your phone, there's a fair chance that your wrist is being buzzed 24/7. And, let's be honest, if you have a lot of notifications, you don't want to be individually deleting them all from your view. You can do that, of course, by simply swiping left on a notification and tapping the cross, but mass deleting is slightly different. In order to clear all your messages at once, Force Press (push down slightly harder than a tap) the screen and you should see the screen change and give you the option to 'X' all of the notifications. If you too often find yourself clearing all your notifications, or you simply don't want them sent to your Apple Watch, you do have the option to manage them completely. Swipe down to open the Apple Watch notification center. Swipe left on a notification, then tap the three dots. If you want to mute the sound or turn off the haptic alerts for that app, tap Deliver Quietly. This will result in the notification appearing in both the phone and watch notification center, but without actually notifying you. If you want to turn the sounds or haptics back on, simply reverse the process - tap the three dots and select Deliver Prominently. Different apps let you customize differently. The top section lets you customize an app's alerts individually, though most third-party apps will only let you turn the option to mirror your iPhone notifications on or off.